You have spent countless hours to come up with the perfect content marketing strategy for your company. You and your entire team has worked tirelessly for the last 6 months on writing quality content and building an envious list of quality subscribers. But your email marketing effort is not yielding any results. Your CEO is demanding email marketing ROI and you have absolutely nothing to show for it. It's not like you and your team didn't work hard enough. You are wondering where did you go so horribly wrong. You have a good subscriber list but conversions are not really happening. It makes you question whether email marketing is dead already? Does it no longer work? But only yesterday this fledgling Boston startup's CMO talked about how email is their single biggest revenue driver. He in fact quoted for every $1 they spend on the email they end up making $38. So why is it not working for your company? Well, the right question to ask first is are your emails even getting delivered. Because if not, then all the effort you and your entire team have put in getting email subscribers from your content marketing, paid Facebook to lead ads and Google PPC campaigns to your landing page are of literally no use. Well, that's what this ultimate email deliverability guide is all about. In this guide, we will not only understand the underworld of email deliverability but also learn how to fix it. Once you have implemented the things outlined in this guide, you will no longer be talking about just the size of your email subscriber list as a success metric for email marketing. You won't just rave about more opens or better click-through rates. You will start talking about conversions and focusing on your email marketing ROI. Email Deliverability is the set of processes that determine whether your email will land in your subscriber's inbox or not. Now you might be wondering but why will my emails not land in my subscriber's inbox? My subscribers opted in to receive my emails and like a good samaritan I am sending valuable content to them. Then why are they not receiving my emails? Are my emails landing in spam box? But I am not a spammer! Mailbox providers analyze various aspects of an email sender and message content to prevent users from spam and malicious content. You don't have to be a spammer to get your emails land in spam. In fact, it is even quite possible that your emails never reached subscriber's email inbox because of the various myriad issues like bounces, blacklists, domain & IP reputation etc. which we will discover in the later parts of the guide. Okay, the funny thing is there is no consensus on what construes as a SPAM. When you send emails to your prospects for a business proposal is that a SPAM? Your subscribers have subscribed to your blog to get updates but you have also sent them an email about your product. Will you call that a SPAM? The most commonly accepted definition of SPAM is Unsolicited Bulk Email or messages sent to a large number of people without any prior permission. So if you have purchased a list and you are sending millions of generic emails to sell your product, its a spam. No questions asked. But if you see some of the previous examples I outline, the email may or may not be considered a SPAM based on the recipient. If the recipient believes that email is unwanted and was sent without permissions then they can mark it as SPAM. Raymond Tomlinson, a pioneering American computer programmer, implemented the first email program in 1978 on the ARPANET system. He is credited as the inventor of email. obtrusive, but some found the email relevant and didn’t think it was a big deal. Thuerk stated he sold “$13 million or $14 million worth” of computers, making him both the father of spam and the father of email marketing. The term SPAM really became popular after it was used in a comedy sketch by Monty Python. The word was used repeatedly to annoy the patron who didn't like SPAM. The term was adopted by early internet pioneers and it exploded in the 1990's when the internet became open. Early spammers leveraged spam to send unsolicited emails to the unsuspecting public. As of today, 70% of all email comprises SPAM. Now in order to solve the problem of massive SPAM, mailbox providers ended up inventing SPAM filters. SPAM filters decide whether the email should exist in the inbox, promotions tab, spam folder or whether it should be blocked completely. Incentives for mailbox providers for providing spam folders are two-fold. At first since 70% of email is SPAM hence a strong spam detecting technology reduces a lot of processing for mailbox providers leading to a higher profit margin. On another hand, it also acts as a strong deterrent against malware and phishing attacks against an unsuspecting public. A gateway spam filter is an on-premises software solution for filtering email. Usually installed as a virtual appliance behind the network firewall, a gateway spam filter is the first line of defense against SPAM. Examples of such SPAM filters are Cisco's IronPort & Barracuda. They are deployed as a cloud solution. They have access to much more data and hence are more sophisticated than Gateway SPAM filters. They can deliver a message to the inbox, move to SPAM or quarantine or block the message. Cloudmark & MessageLabs provide their Hosted SPAM filter solution. They are third party SPAM filters which exist on the users' system. They are highly customizable and get a lot more direct feedback from real users. Outlook uses Microsoft's SmartScreen anti-spam filter to filter email. SmartScreen also gets feedback from Windows Live HotMail users to make the distinction. So SPAM filters largely look at 3 major factors while making filtering decisions. In the next few sections, we will dig into more details about each of these factors. To get your emails into your subscriber's inbox you need to ensure that your email reputation is really good. To understand how Sender & Domain Reputation works, you need to first understand the modus operandi of spammers. Spammers don't have their own email list. They typically purchase it from third party sources. Post that they get a server up and running. Send a few million emails and then are gone. After a pause of a few days,, they will repeat the same process with a different domain and IP. So let's break down the various factors affecting sender & domain reputation. Unlike spammers, any legitimate business grows over a period of time. So their subscriber base also increases over a period of time. Legit businesses send emails to their customers with a regular frequency. So businesses which send emails with a consistent volume have a much better sender score & domain reputation which improves inboxing. Like I said earlier all spammers are fly-by-night operators. To prevent that from happening a lot of publicly available blacklists (300+) have been created. They are used by various mailbox providers and filtering software to varying degrees. 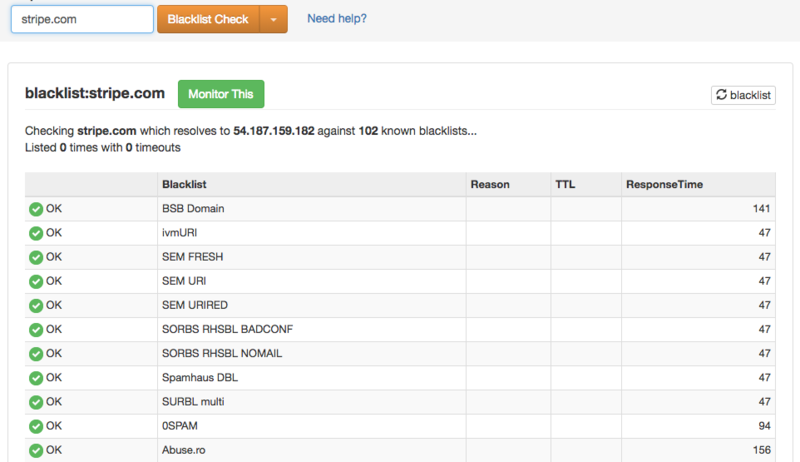 The blacklist looks for domains in email body which have been a known source for spammers. These domains will not be just in an initial link but in the final redirected link too. RBL and DNSBL are used to identify whether the IP of the sending server is an open relay or has been used by spammers or is by an ESP which allows spammers to use their infrastructure. Checking that your domain and sending IP is not in any of the blacklists is one of the first measures which you should take. You can check it from the the following link. They are fake email addresses which are published in a hidden location of the web. The only way these email addresses can be a part of any list is via harvester programmes (crawling for emails) or list purchase. Sending even some emails to these SPAM trap emails addresses may affect your email deliverability. Services like Sender Score provide you details about various SPAM Traps your email campaigns might be hitting. 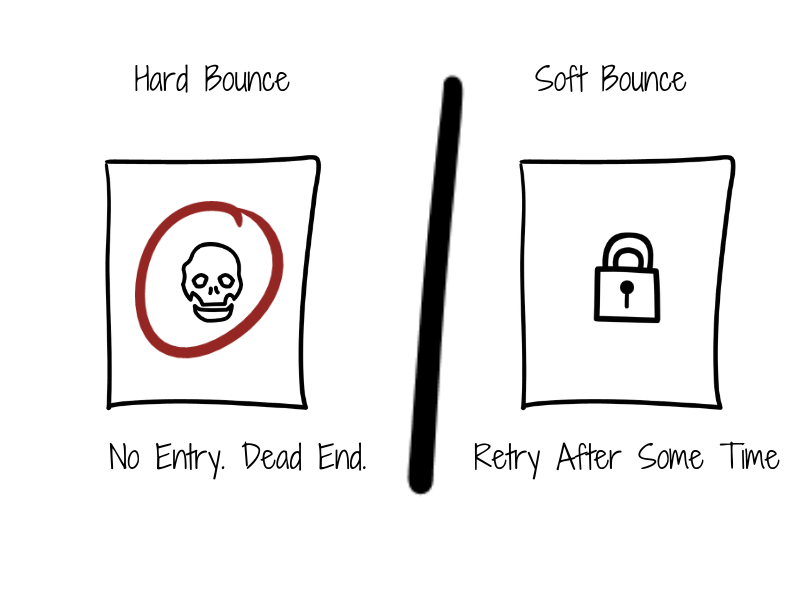 Hard Bounce happens when the email address to which you are trying to send an email doesn't exist. This may happen because someone used a fake email or had a typo while filling email opt-in form. Nevertheless, having an unusually high bounce rate usually points to either not having good list subscriber hygiene or having purchased a list (like a spammer). 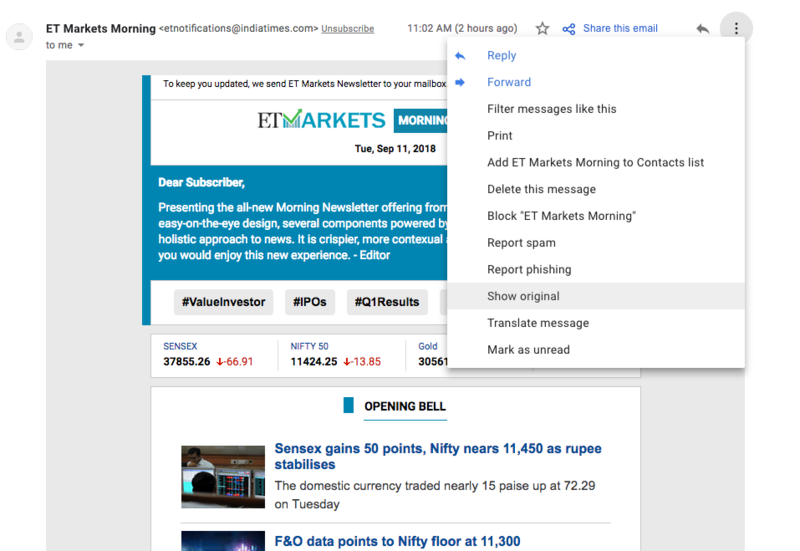 In either case, you or your ESP needs to remove hard bounced emails from receiving any future emails. Continuously trying to send emails to a previously hard bounced email address will lower your email reputation. They have a much lesser impact on email deliverability since a soft bounce denotes a temporary failure in email delivery. It may happen because recipient's email mailbox is full, down or out of office. Re-trying the message delivery after some time may work. However, if the failure happens over several tries you may want to remove these email addresses from your email subscriber list. When your subscribers click on Mark as SPAM option then a SPAM complaint is logged by mailbox providers like Gmail, Yahoo, AOL, Outlook etc. notifying ESP's about the same. Since SPAM complaints are an explicit user signal about unsolicited emails hence even a 0.3% SPAM rate may stop your email from inboxing for your subscribers. Having good list hygiene, double opt-in process, simple 1-click unsubscribe and proper list segmentation is some of the practices which you should incorporate so to stay away from SPAM complaints. We shall be explaining them in detail in the later parts of the guide. Spammers try to game SPAM filters by using new IP's and rotating them. SPAM filters look at sending permanence and IP age to determine whether the sender is legit or not. Sending permanence is about the history of IP address. You can't start sending 100k emails from a new IP on day zero. You need to warm it up and slowly increase your email sending over a period of time. If you don't do that ISP's shall throttle (restrict) your email and filter them as junk email. Only when they see a consistent sending pattern, the restrictions are removed. IP age is about for how long has email sending continued from that IP address. What has been the mailing history and past behavior? Both of these factors comprise IP reputation. A lot of mailbox providers like Gmail look for explicit subscriber engagement and use it as an important email metric for deliverability and inboxing. You should be extra careful while sending Cold Emails as a bad written email can send you straight to spam. So if your subscribers are opening or clicking your emails, adding you to contact book or moving email from promotions or spam to primary inbox etc. then these are really solid subscriber engagement signals. They demonstrate that your audience finds value in the stuff you share with them and over a period of time Gmail or other mailbox providers shall start classifying your email directly into the inbox. Before getting lost into technicalities of email authentication let's first answer why is email authentication even required. The thing is it is easy to impersonate anyone in the email world. I can send emails from donald@trump.com and so can spammers. This makes malware and phishing attack super easy to execute. 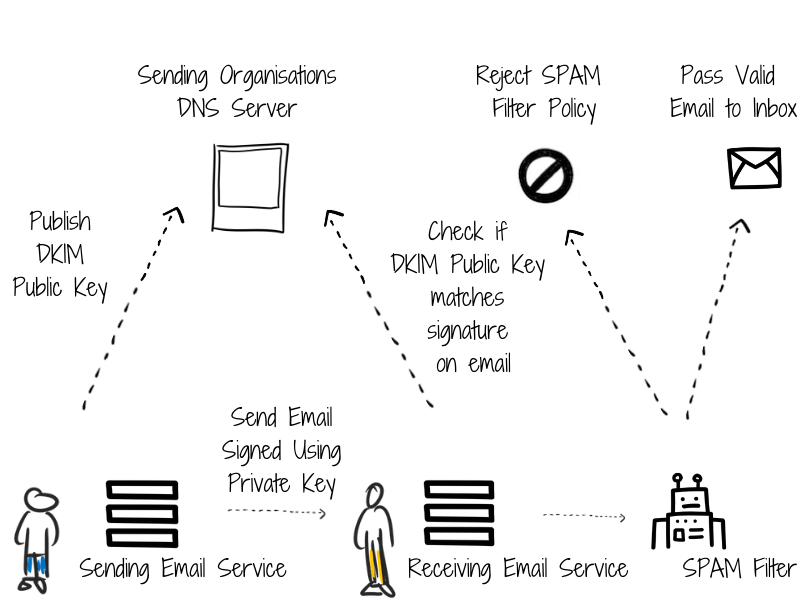 Thankfully various pillars of email authentication like DKIM. SPF, TLS, and DMARC ensure that it is not quite simple. They allow us to authenticate and verify the identity of the sender of the email. Although a sender's reputation is primarily associated with IP, domain reputation is becoming a supercritical piece. Your domain reputation won't be lost on changing IP's or ESPs. It will carry forward. domain by allowing spoofed emails to be flagged or blocked by mailbox providers. Stands for Domain Keys Identified Mail. It provides a mechanism to verify that the email message has come from the domain it is claiming to and the message hasn't tampered along the way. The way in which DKIM prevents email spoofing is by adding a digital signature to outgoing email message headers. This involves using a private domain key to encrypt domain's outgoing message headers and adding a public version of the key to domain's DNS records. Recipients on receiving the message can retrieve the public key from DNS records and use it to decrypt email message headers. This way they can be 100% sure that the message really comes from your domain and hasn't altered during transit. So DKIM helps improve email deliverability by improving sender reputation. Stands for Sender Policy Framework. You can use them to prevent spammers from using your domain for sending unauthorized emails also called email spoofing. An SPF record is basically a TXT record with your DNS provider which lists the mail servers or IP addresses that are permitted to send emails on behalf of your domain. SPF validates who is relaying the email. You can check your SPF records from this link. Email runs over the top of a protocol called SMTP ( Simple Mail Transfer Protocol ) which is unencrypted by its very nature. The email message may go over multiple SMTP relay servers between the original server and actual recipient of the email. Now if your email message is unencrypted then a malicious server can read its contents which should have been private. TLS or transport level security provides a mechanism to encrypt email messages which prevent the content being read from entities other than the intended recipients. Gmail implements TLS for email delivery and it is only some time before it becomes mandatory across various mailbox providers. Stands for Domain-Based Message Authentication, Reporting, and Conformance. The number of domains implementing DKIM and SPF records is really less. As a result, the onus of classifying an email as spam or blocking it is still left on mailbox providers. DMARC is a way to make it easier for email senders and receivers to determine whether or not a given message is legitimately from the sender, and what to do if it isn’t. This makes it easier to identify spam and phishing messages and keep them out of peoples’ inboxes. A DMARC policy allows a sender to indicate that their messages are protected by SPF and/or DKIM and tells a receiver what to do if neither of those authentication methods passes – such as junk or reject the message. DMARC removes the guesswork from the receiver’s handling of these failed messages, limiting or eliminating the user’s exposure to potentially fraudulent & harmful messages. DMARC also provides a way for the email receiver to report back to the sender about messages that pass and/or fail DMARC evaluation. Now that you are familiar with various aspects of email authentication, you should ensure that whatever ESP you are using provides you appropriate DKIM, SPF records, and TLS support for better email deliverability. So far we have talked in detail about Email Reputation and Email Authentication and how they impact our email deliverability. In this section, we will understand the role which content plays. We will outline some of the best practices which you should follow for your email communication and also briefly touch upon the various laws (CAN-SPAM and GDPR) that govern email content. When a message is received by the mailbox provider it first does email reputation and email authentication checks from the email headers. Based on that it will allow, filter or block an email message. If the email message has been allowed at this stage, the anti-spam software will kick in to do analysis on email content and decide to mark your email as spam or deliver it to the inbox or classify it in one of the tabs like promotions or updates. Don't send emails with a single large image. SPAM filters can't understand the context of the image and this is a technique which has been used by spammers. Also, many mailbox providers turn off images by default. As a rule of thumb have enough content in the body of the message so that subscribers understand what is conveyed whether images or on or off. Most emails send via ESPs are HTML emails. Having a broken HTML can lead to broken email experience. Make sure your HTML markup is free of syntax errors and formatting errors. Send a plain text version of every email message that you are sending. Mailbox providers will display the right email based on your subscribers' settings. Also based on your domain sending a plain text email instead of an HTML heavy newsletter may make more sense (eg: professional bloggers) and give you better in boxing and open rates. So test it out. Over 50% email opens happen on email. Mobile-friendly email templates are no longer optional. Make sure your emails render beautiful on mobile. Sending emails via your personal email address is almost guaranteed to be classified as SPAM. 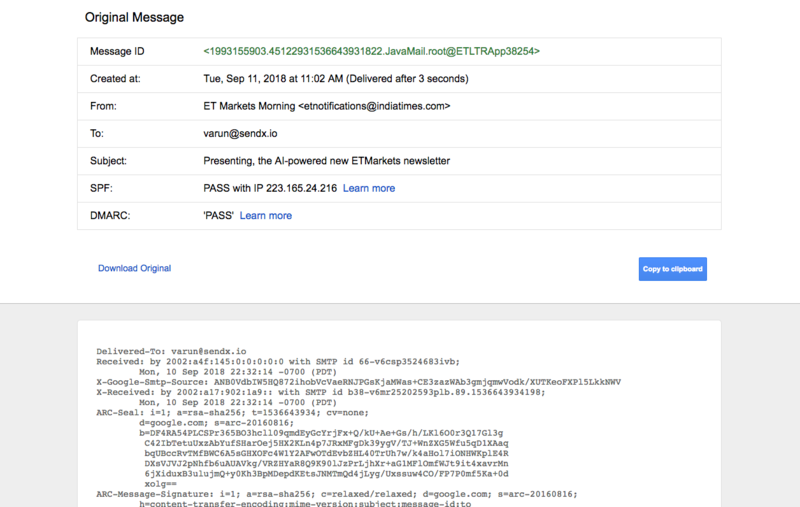 Get a business email address and get DKIM, SPF and DMARC setup done properly. Usage of some words in your subject lines may trigger SPAM filters. Words around the lottery or asking for money deposit or all caps in subject lines are found to trigger spam filters. URL shorteners are available for anyone and everyone. As a result, they are used by spammers to share malware, phishers to scam unsuspecting user and folks doing all sorts of illegal activity. If you are sending both transactional and promotional emails then use different sender email addresses. In fact, if even the type of promotional emails which you are sending vary a lot like newsletters and product updates, I would suggest you use different sender email addresses. Classification of emails on which tabs (promotions, updates, social etc.) happens based on email content as well as sender email address. Having a consistent brand look & feel to your email will improve recall and reduce the change of your email being marked spam by your recipients. Getting folks to add your email address to their contacts also has a massive impact on email deliverability. It is know to improve email deliverability significantly. This is something which we shall discuss in the later part of the guide. However, segmenting your audience and personalizing relevant content will determine whether your email is being opened and engaged consistently by your audience or not. This feedback over a period of time will be used to classify your emails appropriately. 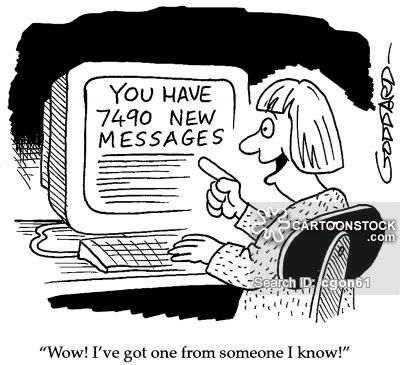 An average office worker receives over 121 emails daily. That's quite a lot to go through in a day. 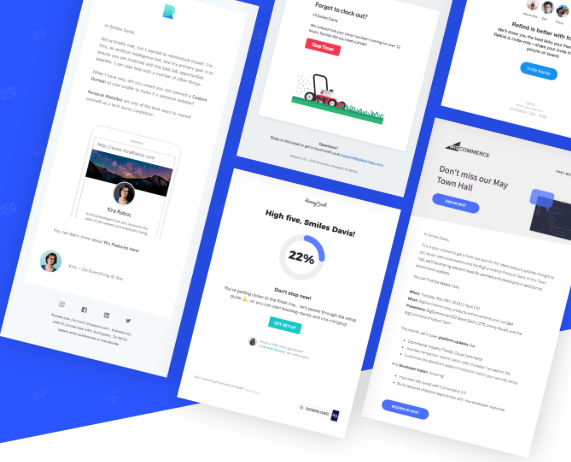 With increasing email volumes, mailbox providers have increasingly started looking at recipients engagement with your content, to determine its inbox placement. Maintaining an engaged subscriber base is essential for you to keep getting ROI from your email marketing efforts. And this is exactly where list hygiene comes in. Opt-in is explicit confirmation by a subscriber to allow a marketing team to send messages about promotional information about their brand. Single Opt-in is a single step process where your subscriber gives consent to receive emails from you by filling a form, downloading an ebook from landing page or filling a popup. Double Opt-in, on the other hand, takes extra precaution to ensure that only good subscribers are being added to the list. To do that usually a confirmation email is sent to the subscriber after they did a single opt-in. Only after they click the email contained in the confirmation email, they will start receiving emails from your brand. Single Opt-in is more lenient and as a result, you will have subscribers who either opted-in by mistake or someone else ended up giving their email. Single opt-in emails also may have a much higher bounce rate. Double Opt-in, on the other hand, leads to drop off of a percentage of subscribers since many of them won't end up confirming by clicking the confirmation email. However, the list quality and engagement is significantly better than Single Opt-in lists. Determining which of the opt-in processes is best will depend on the type of business you are in and your industry. You should be segmenting your audience based on data you have about them, actions they perform and how they interact with your email. 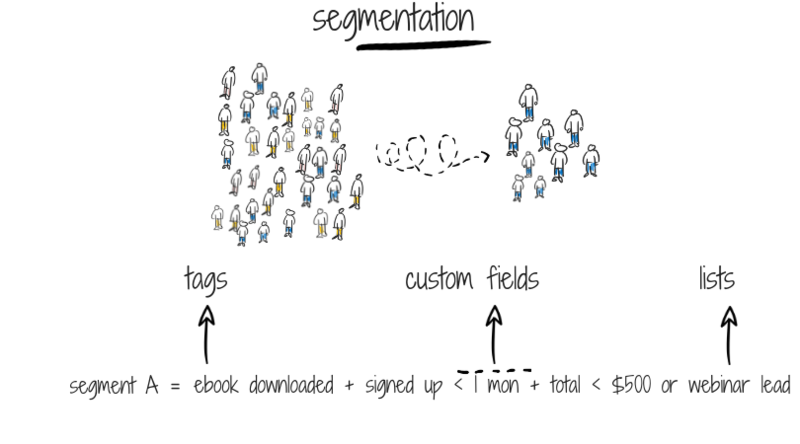 Sending relevant emails based on tags and dynamic segments leads to much higher subscriber engagement. You should also prune out folks who are no longer engaging with your brand. Having a lot of inactive subscribers affects your email deliverability negatively. Folks who haven't opened your last 20 emails are highly unlikely to open your 21st one. So it is advisable to either remove them from your list or send them emails at a lower frequency when compared to your most engaged audience. You should make the unsubscribe process really simple and straightforward. Your subscribers shouldn't have to fill a form or wait for a week just to be removed from your list. It is annoying and disrespectful to their privacy. A bad unsubscribe flow is highly likely to get your emails marked as SPAM by annoyed subscribers. So make the unsubscribe option prominent and ensure you have a single click flow for people who want to get off your mailing list. The email address which you are using should have a mailbox. You shouldn't be using a no-reply@biz.com email address since it is impersonal and makes you look unapproachable. A more important reason for not using a no-reply email address is that some of your subscribers shall reply back to get them off your marketing list. A non-functioning from & reply email address will likely infuriate them to hit the SPAM button. Make your emails stand out. Personalise them using name of your recipients. Change the message based on their attributes or actions. Your message needs to cater to them. Smart ESP's allow you to do one-to-one communication at scale. That is what email personalization is all about. To improve email deliverability and subscriber engagement, you should AB test on your email subject lines, from name & email, delivery time and email content. Opinions don't matter. Data does. Run AB tests to see what is working and double down on that. Sometimes there is nothing wrong with your email reputation, email authentication or even content. It is just that time when you are hitting your subscribers is not apt. They may be in Australia and you are trying to reach out to them in US timezone. You should send your emails by leveraging geo optimized send which sends email is the user's timezone. Or you can leverage features like Smart Send which sends email based on historical open & click time of your audience. Delivery time optimizations can have a massive impact on your subscriber engagement and help you get far better to email inboxing as engagement levels increase. In the last section, we covered the good list hygiene practices and various ways to increase subscriber engagement. This section is focussed towards helping you decide on what IP infrastructure should be sending emails - shared or dedicated based on your business requirements. We will discuss the pros & cons of both the choices. This is best when you are sending a consistently high volume of emails. Dedicated IP will be used exclusively to send your campaigns only. It helps you built a reputation over a period of time. 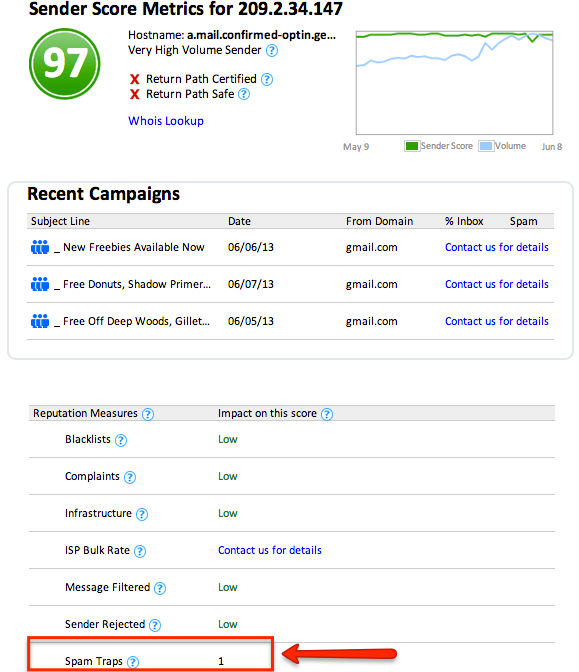 It allows you to be in total control over your email deliverability. On the flip side, inconsistent sending pattern or dips & spikes in email sends may lead you being classified as a spammer. If you are sending more than 200k emails on a consistent basis per campaign then opting for dedicated IP will be the better choice. SendX provides you the ability to have a dedicated IP or pool of dedicated IP's based on your requirements. We also help our customers to warmup IP as well as domain appropriately so that email deliverability is not hampered with increasing email volume. When you are just getting started as a business or have a very less number of subscribers ( less than 100k ) then you won't have consistent email sending volume. 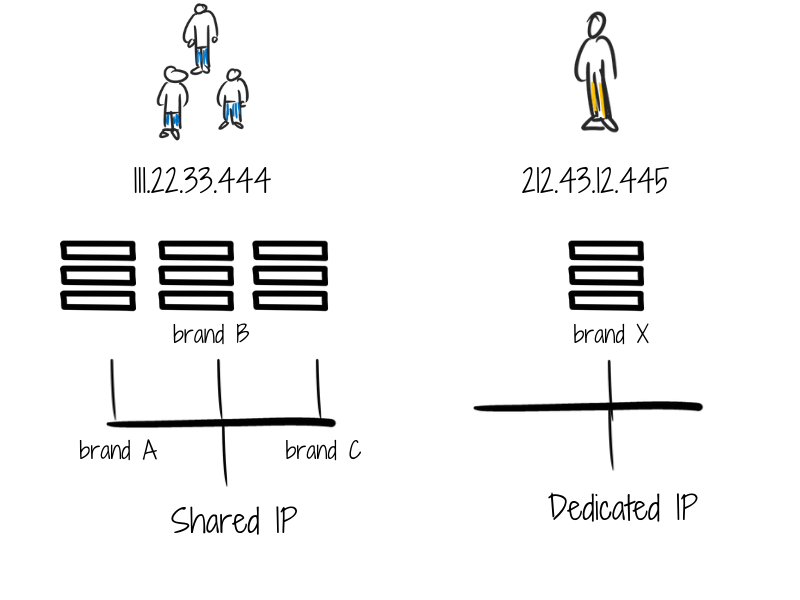 On a shared IP pool, you will have many businesses sending from the same IP. This leads to a consistent sending volume which in turn helps improve email deliverability. If your email deliverability and open rates are below average than others in the shared IP pool then your email deliverability will get an uplift. On the flip side if your deliverability is better than other members of the shared IP pool then you may experience a dip. SendX, however, maintains multiple shared IP pools based on domain age, historical spam, bounce, unsubscribe & open rates. This tiered shared IP pool ensures that all businesses get deliverability spike owing to consistent email sending volume and similar subscriber engagement patterns. This guide has been written as a resource which we wished existed for us at SendX. I hope that it gave you a 360-degree view of the various factors contributing to whether your email lands in someone's inbox or not. You will have a much better understanding of fixing the problems outlined and best practices to incorporate for email marketing in general. If you implement the things outlined in the guide, and couple that with Web Push Notifications, you will already be way ahead than 99.99% of businesses sending millions & billions of emails every year. And you will finally be able to get conversions, recover abandoned carts and make money from your qualified leads which you have so painfully acquired. Because if your subscribers don't receive your emails and see your message then do they really exist? To help you improve your open rates, we’ve compiled the biggest list of the top email subject lines (295+) to ever exist on the internet. You can use these subject lines as inspiration and swipe them right off! This is the ultimate guide to dominating Google Ads in 2018 and beyond. All the strategies in this guide work amazingly well in 2018.